Trout Fishing in North Georgia, 4th Edition – Peachtree Publishing Company Inc. Learn when, where, and how to catch the best trout in the northern part of Georgia. 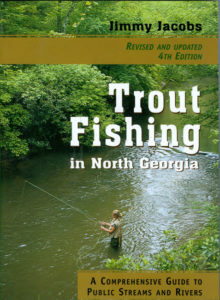 This comprehensive guide, now in its fourth edition, provides extensive yet easy-to-read information not only about how to catch trout, but also about fishing locations in Georgia and how to get to them. The book now includes photographs and has been completely updated, to include five new streams and revised information on 73 other creeks, rivers, and ponds. Addressing all three fishing methods—bait, spinner and fly—the guide also describes the history and variety of trout. Jacobs offers plenty of tips about equipment, tackle and techniques for the best results. The book includes detailed maps and directions as well as the special regulations governing each stream. Whether a novice or a seasoned pro, any trout fisherman hoping to land this delicate and elusive quarry will find Trout Fishing in North Georgia a valuable resource.